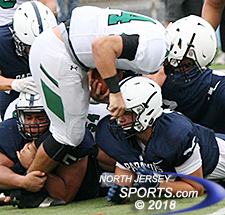 PARAMUS – Up against Pascack Valley in what figured to be it first real test of the season, Paramus was hoping to start fast in front of the home crowd. A good first drive and a defensive stop might set a tone that the Spartans could feed off for the rest of the night. Starting fast was imperative to the Spartans’ success but not even the most dedicated supporter of Paramus could imagine the scenario that played out over the game’s first seven minutes and 30 seconds. On Friday night Paramus pulled off a remarkable feat against any team, let alone against a team the caliber of Pascack Valley, which was unbeaten coming into the game. The Spartans scored touchdowns on four of their first 10 offensive plays, including a pair of long scores on their first two plays from scrimmage, and never looked back in a 48-14 romp over PV. Paramus received the opening kickoff and went 61 yards in just one play. Junior quarterback Trevor Bopp threw a wide receiver screen to Justin McKeon and the senior speedster did the rest by breaking a tackle along the sideline and going the distance to put Paramus ahead, 7-0, just 22 seconds into the contest. After forcing a quick three-and-out, the Spartans found paydirt again on their next offensive snap. Bopp faked a handoff and ran through a gaping hole up the middle before splitting the safeties and running all the way to the end zone for a 14-0 lead just over two minutes in. Jake Williams ran up the middle for a four-yard touchdown on the first drive of the third quarter to get PV within 35-14. Hopes of a comeback by the Indians were quickly derailed when they fumbled on the very next play and Paramus defensive back Matt Ivanicki recovered in Pascack Valley territory. Four plays later, on fourth-and-3 from the 31, bruising running back Kyle Jacob showed off his power and speed in one play. He took a screen pass from Bopp, stiff-armed a defender to the ground then outran the defense to the end zone to make it a three-score lead. After the Spartan defense forced another three-and-out and a muffed punt, Jacob went right back to work with a short field. He rushed for all 40 yards on the drive, capped by a 14-yard TD run off a huge block from left tackle Robert Colonna with 4:30 to play in the first quarter. Before the Indians even gained a first down, Paramus had already built a 28-point lead and essentially put what was supposed to be a close game away early. Even the defense got involved in the scoring spree with senior defensive lineman Dan Chermark scooping a fumble in the second quarter and going 24 yards to the end zone. Max Weappa hit his fifth consecutive PAT attempt to make it 35-0. Pascack Valley’s first five possessions netted a total of just 13 yards before finally moving the ball on its final drive of the first half. As time expired Stephen Begen hit Gio DeGiglio, who, with two defenders hanging on, stretched the ball over the goal line to get the Indians on the scoreboard. 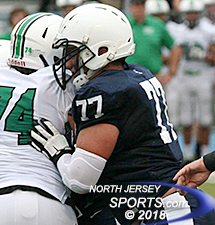 Robert Colonna and the big boys up front won the battle in the trenches for Paramus. The momentum from the Indians’ first touchdown carried over into the second half. Jake Williams ran up the middle for a four-yard touchdown on the first drive of the third quarter to cut the lead to 35-14. Midway through the third quarter, the Indians made a fourth-down stop near midfield to get the ball back with good field position. Led by linebacker Matt Amato, the Spartan defense buckled down and forced yet another three-and-out to get the ball back. Jacob ran roughshod over and around the PV defense all night, capping his career best game with a pair of fourth-quarter touchdown runs. Jacob carried the ball 15 times for 163 yards and three touchdowns for Paramus (3-0). He also added a receiving touchdown and seven tackles. Bopp had an incredibly efficient night completing six of his seven pass attempts for 146 yards and two touchdowns. He added 117 yards on the ground with a TD. Wide receiver Steven Prado made the play of the game early in the fourth quarter with a spectacular one-handed catch for a 33-yard gain to set up a Jacob TD run. Begen accounted for 172 yards of offense (113 passing, 59 rushing) to lead Pascack Valley (2-1). With its third win of the season, Paramus has already matched its win total from 2017. The initial goal coming into the season was to make the state playoffs, but with three straight blowout wins over quality opponents to start the year, the expectations have been raised significantly and the Spartans feel that they can be contenders for both league and state sectional titles.